Aroma Housewares Professional 6 Tray Food Dehydrator is the second name of facility and convenience. Picture yourself comfortably waiting for the food to heat up and dehydrate as the delicious aroma wafts into your room from the delectably hot food, and you do NOT have to take turns to dehydrate the whole dinner course. Well, it does not have to be wishful thinking anymore as with Aroma Housewares Professional 6 Tray Food Dehydrator, no course is too big, and no meal a hassle! The 6 tray feature flaunts large space to suffice a large amount of intake. Aroma Housewares Professional 6 Tray Food Dehydrator, Black is a must have these days. When using this dehydrator, you can remove moisture quickly from your food. This machine is also supported with an automatic fan that helps in even drying of the food. The Aroma Professional Dehydrator efficiently handles everything from fruit slices to beef jerky on six large, height adjustable trays. It has an automatic fan which promotes even drying and helps to avoid the overheating that reduces food's important nutrients. This dehydrator also has an adjustable thermostat which ensures that all foods are dehydrated at their optimal temperature. Its temperature can be adjusted from 95 to 155 degrees Fahrenheit. What Comes with the Aroma Professional 6 Tray Food Dehydrator? The Aroma Housewares Professional 6 Tray Food Dehydrator offers all the features needed for outstanding results. This food dehydrator provides lots of benefits and functions to ensure the best experience for the users. It allows you to make healthy snacks without any additional preservatives to your product. So let’s dig more and see just what kind of significance Aroma brings to the table. 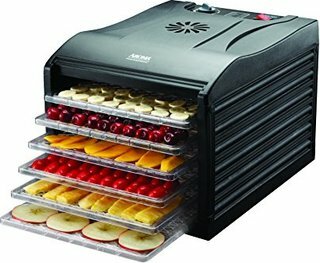 Aroma Professional dehydrator is adaptable and can dry large amounts of food, which have different levels of moisture. This machine dries a variety of different foods at the same time. These food products can be vegetables, fruits, meat, and even herbs. 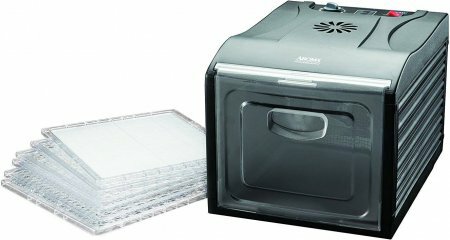 Aroma professional 6 tray food dehydrator has 5-square foot capacity and six adjustable height trays that can be removed to create space for different types of food. These removable racks can support up to 1lb of food on each level. So that means it can dry 6 pounds of food at once. The flexible temperature choice allows you to dehydrate foods between 95 and 155 degrees which mean that you can set the temperature to 155 degrees when making beef jerky and set it back down to 95 degrees when drying fruit. Isn’t this perfect? The fan in Aroma Dehydrator is less noisy as compared to other dehydrators present in the market. This dehydrator will not disturb your daily routine or even if you use it at night, there won’t be any disturbance. This dehydrator comes with a drip tray at the bottom, which will make your life trouble-free. So any juices that may drip down can be quickly cleaned up. It also reduces the smell that some units have after use. Aroma professional food dehydrator looks stylish, sleek, and appealing. Therefore, users can place it on the kitchen countertop in their pursuit to improve the overall outlook of the kitchen. The shape and design of this dehydrator are very convenient and friendly. Its black exterior allows this dehydrator to fit with any kitchen’s interior. 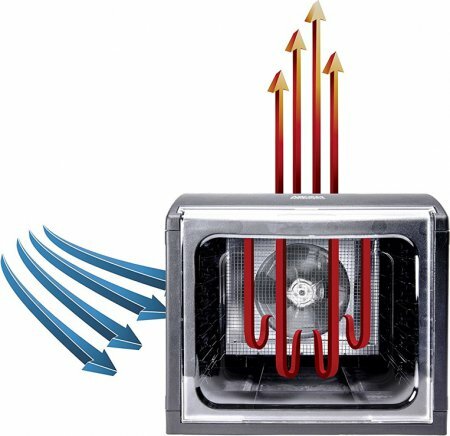 This appliance has a flat type of airflow, which is convenient and facilitates even distribution of heat. As a result of that, the trays receive an equal amount of heat. The horizontal airflow helps in even distribution of heat across all the trays. This food dehydrator has a transparent door, so you do not have to open it all the time to check the contents on the trays. This feature is very helpful in minimizing problems linked with heat loss which leads to the inefficient working of the machine. This dehydrator is small in size and can be placed easily on kitchen counter regardless of the kitchen size. Due to its small size, it can be moved easily from one place to another. Aroma Professional Dehydrator has an automatic fan for even heat distribution, while it’s drying the food. Due to even heat distribution throughout the trays, there is no need to rotate the trays manually to get the food dried efficiently. This appliance has a square design unlike most dehydrators present in the market. This square design is far more durable than its circular counterparts. The trays in square dehydrators are much durable. All trays and the door are made of food-safe BPA-free plastic. So you need not worry about the hazardous effects of plastic. Aroma Professional 6 Tray BPA Free Food Dehydrator comes with a transparent door, and many more power packed features. Following is the list of things you get at the time of purchase. Aroma Professional Dehydrator comes with a convenient feature i.e. drip tray, which reduces the mess and makes the cleaning effortless. A very handy drip tray catches any drips or residue from the drying process and makes clean up quick and easy. After unboxing the Aroma Professional Dehydrator, you will get six removable clear, drying trays. Each tray’s size is 12" x 13". These trays are square thus allow a large space for the placement of food as compared to other rounded trays. The manufacturer claims the trays to be BPA free. The company has added one operation manual which describes the proper method of how to dehydrate food or how to clean up the product. This manual also includes two drying recipes and details about product’s warranty. The temperature range of Aroma Professional Dehydrator is 95°F to 155°F. This wide range of “temperature control system” allows you to dehydrate a lot of items. The Product dimension is 13.58 x 17.72 x 12.4 inches. Due to its small size, it can be placed easily even in a small kitchen. Aroma Professional Dehydrator requires 300Watts of power to work fluently. This product uses less energy as compared to other corresponding items. It comes with five years manufacturer’s warranty. The 5-year warranty is a commitment to you that your dehydrator will provide years of trouble-free operation. Total weight of the Aroma Professional Dehydrator is 11.68 lbs. It is a light weight dehydrator and can be positioned anywhere with no trouble. This dehydrator features horizontal air flow which promotes even drying compared to cheap vertical air flow dehydrators. This dehydrator also has an illuminated On/Off switch to indicate that the dehydrator is on, which is convenient for the customer. Aroma Dehydrator is made of BPA free plastic material and is black in color. This appliance has an automatic fan, which helps in even drying. It also prevents overheating and ensures food's vital nutrients are not eliminated thus leading to optimal results. This machine comes with 6 adjustable height trays. And each tray can support up to 1 pound of food. The number of trays is fixed and cannot be increased. The advantageous attributes Aroma dehydrator is offering you are listed below. These traits will help you know better about the product. Here is the list of all the benefits you will get after buying Aroma Professional Dehydrator. The Aroma dehydrator is handy and efficient enough to dehydrate all types of foods effectively. It can dry large amounts of food, which requires different temperatures to dehydrate. These food products can be vegetables, fruits, herbs, and meat. Another benefit the Aroma dehydrator offers over other contemporary appliances is the quiet fan. Numerous famous brands are loud to operate whereas this model is silent and does not disrupt your daily life. For drying large food slices, the option of being able to take out the shelves to suit the space required makes this type of dehydrator so much more practical than the stackable type. The clear, removable door makes it possible to monitor the food as it dehydrates, which saves you from the hassle of checking the food. This door is also easy to remove for cleaning. 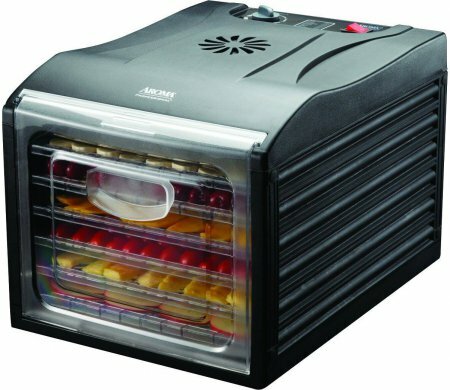 Aroma Professional Dehydrator is small in size hence, light and easy to move. When not in use it can be easily packed away. It can be accommodated in even small kitchens with ease. According to the manufacturer, the door, trays and mesh sheets are made of BPA free plastic. The Aroma Housewares Company provides a warranty of five years. This warranty period is longer as compared to the warranty periods of other contemporary dehydrators. The addition of a drip tray at the bottom to catch residue during the dehydration process is an additional bonus that makes it easy to keep the inside of the dehydrator clean. This dehydrator has rectangular trays; which makes the arrangement of food easier than round trays. These rectangular trays are more durable as compared to the round trays. There are no difficult technicalities when using Aroma Housewares Professional Dehydrator. It is easy to use with illuminated on/off switch. Control panel is on the top of the machine, as opposed to the panel at the rear of the machine. Aroma Food Dehydrator is renowned for the efficiency and quick drying time for all foods, the uniformity of drying on all surfaces as well as the texture of foods dried. It is an attractive, efficient and versatile food dehydrator that comes at a very reasonable price. Just as much important it is to know the benefits of Aroma Dehydrator, in the same way, it is important to learn about the disadvantages of this dehydrator, which will also assist you in making your decision. 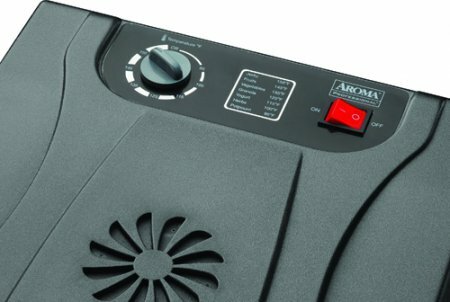 There are no real significant cons to the Aroma Professional dehydrator. Below is the list of shortcomings this dehydrator possesses. This dehydrator cannot adjust even a single extra tray. It has fixed 6 trays. So if your dehydrator is packed with foods, and a still pile of food is waiting on the counter shelf for its turn, you won’t be able to add extra trays to accommodate the food. The instruction manual is insufficient, with only two recipes and bare bones instructions. There are no tips or dehydrating techniques included in the manual. This dehydrator is relatively small in size and a treat for small families, as it caters their need very well. But Consumers looking for the largest capacity dehydrator for their big family should think before taking the decision. Having a timer in a food dehydrator is a real convenience for the users, it saves them from hassle. But Aroma Dehydrator lacks this facility. Following are the most frequently asked questions about this dehydrator. Q: Can We Increase the Temperature Up to 160 Degrees? No, the maximum temperature setting is up till 155 degrees, and it can’t be increased further. Q: I Am Using a Dehydrator for the First Time, and I Feel Like It's Taking Too Long to Dehydrate the Food, Is It Normal? It depends on what type of food you are drying up. If you would cut the food in pieces, it is going to take less time. Beef would take long to get dried up as compared to fruits or vegetables. Q: Can I Use This Dehydrator to Make Yogurt? Yes! You can make yogurt in this dehydrator. You need to put your yogurt in a container with a lid. Set the dehydrator to 115 degrees. Q: I Want to Know About the Vent on Top of This Dehydrator, Can We Open and Close It Manually? The vent on top of Aroma Dehydrator is to emit the moist air out of the machine for best dehydration of the food. No, we cannot open or close it. Q: What Is the Range of Temperature in Aroma Professional Dehydrator? Aroma Professional Dehydrator offers the temperature range from 95 – 155 degrees Fahrenheit. This wide range of temperature makes it possible to dehydrate a wide range of food in the dehydrator. Q: Can I Dehydrate Whole Fruits and Vegetables Instead of Cutting Them? Yes! You can dehydrate whole fruits, but in that case, drying would take longer as compared to the fruits cut into small pieces. Q: What Is the Texture of Apples after Drying in the Dehydrator? Do They Get Crunchy or Spongy? After the process of dehydrating, the apples become crispy and tasty. They aren’t squashy at all. Q: Does the Aroma Food Dehydrator Come with a Timer? There is no timer in Aroma Professional Dehydrator. Q: What Is the Size of This Dehydrator? Can I Fix It in My Small Kitchen? The unit dimensions are 17.7 x 13.6 x 12.4 inches. It's not that big and can be easily fixed even in small-sized kitchens. Q: How Does Aroma Dehydrator Blow the Air? Is It Horizontal, from Back to Front or from Top to Bottom? Aroma Professional Dehydrator blows air from back to front, which leads to even distribution of heat through all the trays. Q: Is This Appliance BPA Free? The manufacturer claimed that the door and 6 drying trays are made from BPA free plastic. Q: I Need Temperature Setting Below 90 Degrees. My Temperature Requirement Right Now Is 85 to 90 Degrees. Can I Acquire This Temperature? The thermostat setting starts from 95 degrees up till 155 degrees, so there is no way you can set the temperature below 95 degrees. Q: Is This Dehydrator Entirely Made of Plastic or It Has Metal on Its Body as Well? Only the back side of Aroma Dehydrator is made up of aluminum, rest of the body is made of BPA free plastic. Q: Is It Necessary to Use Parchment Paper on the Trays? Is There Any Need of It? The parchment paper makes your life eas﻿y. It prevents the food from sticking to the trays, thus avoid the mess. I would highly recommend you to use it. Q: Does This Dehydrator Make Noise When Running? No, this dehydrator is silent; it only produces a very low “humming” sound while working, which is not at all disturbing. Q: Where Is the Fan Located, on Top or at the Back of Dehydrator? The fan is at the back of dehydrator. It helps to dry all the food evenly and efficiently n gives the desired result. Q: Will This Dehydrator Work in Any Other Country, Let’s Say Russia? It can work anywhere, but you need to have a voltage converter outside the USA. Q: I Want to Know About the Front Door of Aroma Professional Dehydrator. The front door is made up of BPA free plastic. It is a see through door, which enables you to monitor the progress of foods drying. Q: Since the Whole Appliance Is Made Up of Plastic. Does It Pass on Plastic Smell in the Food When the Appliance Heats Up? No, the plastic quality is amazing, and it does not leave the smell in the food at all. Q: I Want to Know About the Plug, Is the Plug Two-prong or Three-prong? The manufacturer claims that it has a two-prong polarized plug where one prong is wider than the other and can be inserted in the outlet one way. It does not have the third ground prong. Q: Can We Do a Wet Marinade for Beef Jerky in This ﻿﻿﻿Dehydrator﻿﻿﻿? Will It Work Fine? Yes, you can do this, but put a catch tray underneath to collect the residue. Q: Is It Difficult to Clean This Machine, Like My Previous Dehydrator? Due to the drip tray, it is easy to clean it up. Just remove the tray and wipe it out. Q: Is This Dehydrator Energy Efficient or Consumes High Power? It is just 300 watts machines, which is very low wattage. Thus it would not spike your bill up. Q: Can I Wash My Trays in a Dishwasher? No its better to wash trays by hands. The trays are not suitable to be washed in a dishwasher. Aroma Professional 6 Tray Food Dehydrator, Black is one of the top food dehydrators that provides a satisfying experience to its users. This domestic device provides an excellent substitute to healthy food free from harmful preservatives and in the comfort of one's home. The Aroma Professional is a shelf tray model perfect for the home aficionado, backpacker or anyone trying to be a little more health-conscious. The Aroma Dehydrator offers reliable, steady and efficient operation as well as good value for its mid-level price in the shelf tray line. If you want a dehydrator with a large capacity, even drying and refined temperature controls, this is the right model for you.